In the video, my toddler can be seen dancing along with his older brother, occasionally attempting to mimic his amateur break-dancing moves, all while happily sucking on his pacifier. It caused a little controversy. One of the commenters noticed my son’s pacifier and asked about it. He didn’t ask about the weird 30-year-old-song choice, or the ridiculous attempts at break-dancing, or the 20-month-old twerking. Nope. 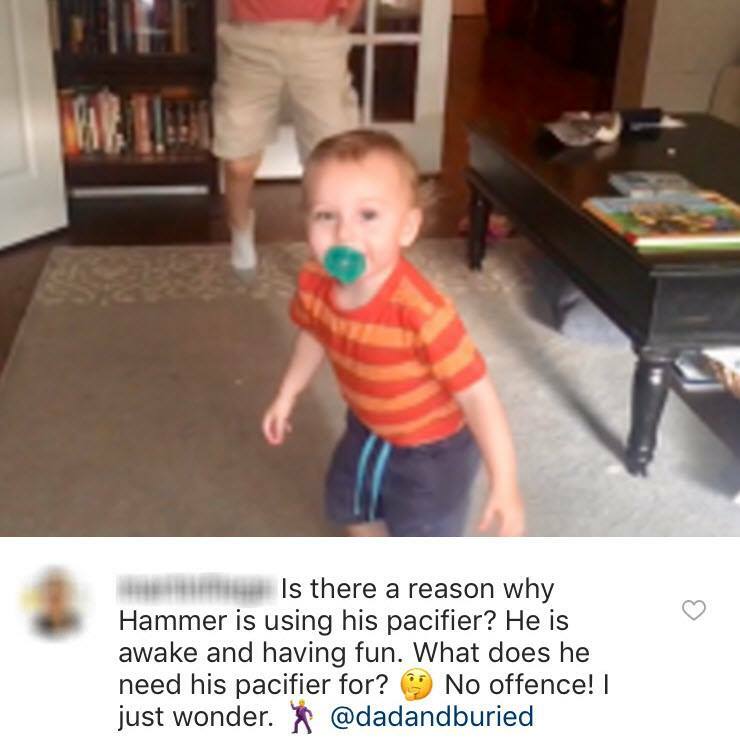 He wanted to know about the pacifier. Oh “No offence!” Cool. Cool cool cool. NONE TAKEN, RANDO. First things first: it’s none of your business. 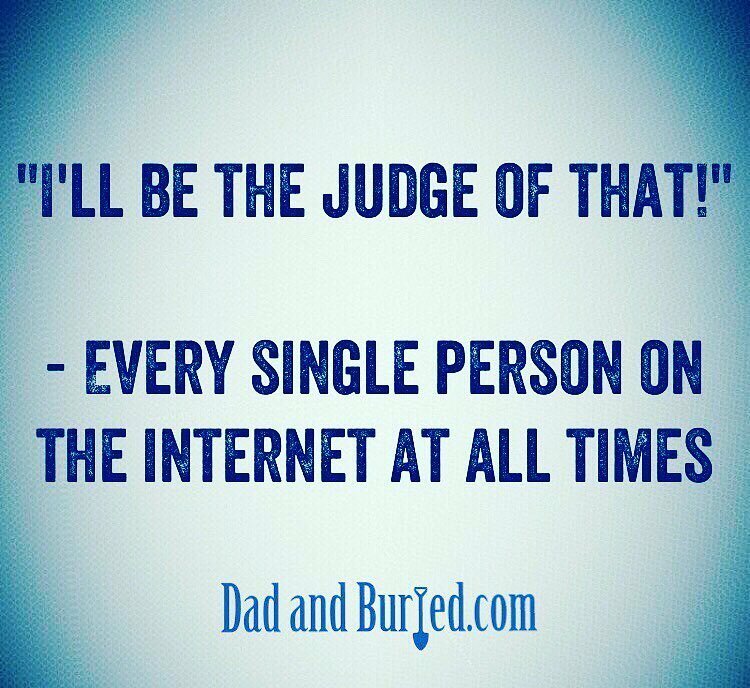 Don’t judge me! And finally: why do you think the little dude is happy and isn’t crying, smart guy? Might the pacifier be helping? Look, I’m no expert parent, but I have dealt with a toddler before, and one of the things I learned the first time around is to never underestimate the stuff that makes your kids happy. And quiet. Every parent knows that you have to take some shortcuts sometimes. You have to pick your battles. My wife was grateful for the few minutes of personal space, during which she was actually able to make dinner without the kids scrambling around underneath her feet and/or screaming bloody murder for no reason. And it’s not like my kid is chewing on cigarettes. So where’s the downside? Whether it’s giving the kids an extra half hour of TV so you can catch an extra half-hour of sleep, or stopping for a Happy Meal because you’re too tired to cook, or letting the toddler ride shotgun because the car seat is covered in pudding (jk – but not about the pudding), it’s okay to let some things slide every once in a while. In fact, it’s necessary! For your sanity. We shouldn’t judge each other for the things we do to survive. Is it a good idea to let Netflix babysit your kids? No. Is it healthy to give them McDonald’s for every meal? No. Is it problematic for your toddler to rely on his pacifier until he’s in elementary school? Probably, but odds are you’re gonna need braces anyway. But we all need a break, we all need a win, and sometimes it takes a bit of cheating to get one. No one deserves to be judged or shamed when they actually find something that works. I know I make myself a target by putting stuff online. It’s 2018. Judgment is a way of life. Besides, I guarantee there’s something in your parenting closet – in everyone’s – something you do despite the experts frowning upon it, because it keeps the kids quiet, so to hell with the experts! My 8-year-old has never once used a pacifier, but he still clings to his Lovey, and I guarantee if that was on video someone would have said something about that too. But it helps him sleep, and our family is never happier than when the kids are asleep, so what’s it to you? Why must you judge me? WHY WON’T YOU LET ME BE HAPPY?! The point is, why are we sweating the small stuff? And why are strangers coming down on us for it? This is parenting, you gotta do what you gotta do. To quote Michael Jackson: “There’s a choice we’re making. We’re saving our own lives!” And we’re not harming our kids.